Because if your cup smiles in the morning, so should you! - Remember the song, ‘when you’re smiling, the whole world smiles, with you’? But how often is it that you find yourself frowning your way to an unhappy day!This cute little mug has the right idea. A smile to begin the day and you’re on your way to another great journey! 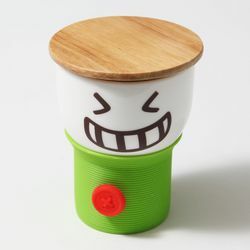 This little guy is quite practical too, he can easily hold the ideal dose of caffeine for your morning pick me up and his smart little wooden lid also keeps your drink steaming hot! -So whether you want it as a reminder to smile every morning or to gift a smile to your friends, this little mug can do the trick both ways!